Home » Bike Reviews, News & More » London Motorcycle Museum Threatened With Closure! From an industry perspective, do motorcycle museums matter? OK, so the oily exhibits delight creaking baby-boomers keen to bore anyone polite enough to listen with their “when I was a lad” stories and may even spark some reluctant interest in their accompanying grandchildren, disgruntled at being dragged away from their PlayStations. But do museums make any difference to the future of motorcycling? As far as the London Motorcycle Museum is concerned, you’d better make your mind up. And if you think it’s important to preserve the past, it’s time to dig into your pockets or dip into that precious flexible pension pot. The museum, owned by long-time motorcycle dealer Bill Crosby and run by a charitable trust, is in financial crisis following a swingeing rates rise by big, bad Ealing Council. Basically, the council cancelled the charity’s 100% subsidy, back-dated its rates demand – meaning the tourist attraction instantly owed more than £10,000 – and is insisting on £460 a week three months in advance. 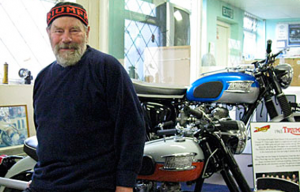 Crosby is 82, has owned Reg Allan Motorcycles in the capital for 58 years and set up the museum in a former farm in Greenford 18 years ago to house his personal collection of 200 bikes, many of them Meriden prototypes and now owned by the trust. With the clock running, he’s not sitting about waiting for a bail-out. Crosby is selling a 1983 AV Triumph 750 Bonneville he owns to keep the council wolf from the door, and the trustees are desperately trying to come up with new revenue streams. But unless supporters rally to the cause in the short-term, Crosby’s dream may go up in a cloud of blue smoke. Donations can be made on the museum’s Just Giving page here. Thank you to Paul @ British Dealer News for allowing us to run this article.